This tool helps on the construction of Queries in a Wizard form. These queries can be saved and used later. 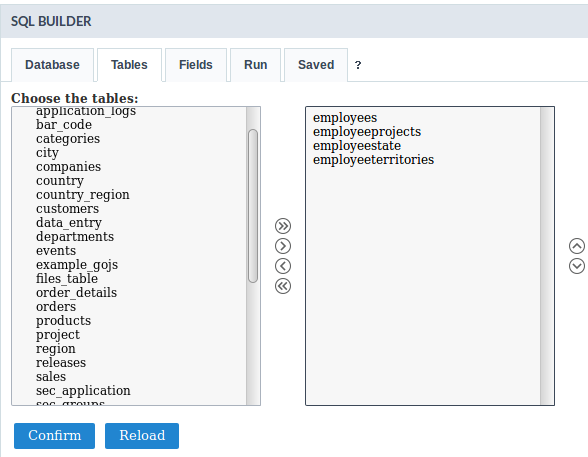 Any SQL can run directly from the Run tab that will be available after selecting the database. Firstly you need to select the connection(Database) that you want to use. 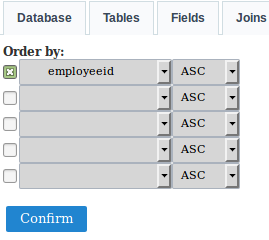 All the existing tables in the database are listed in the Tables tab. 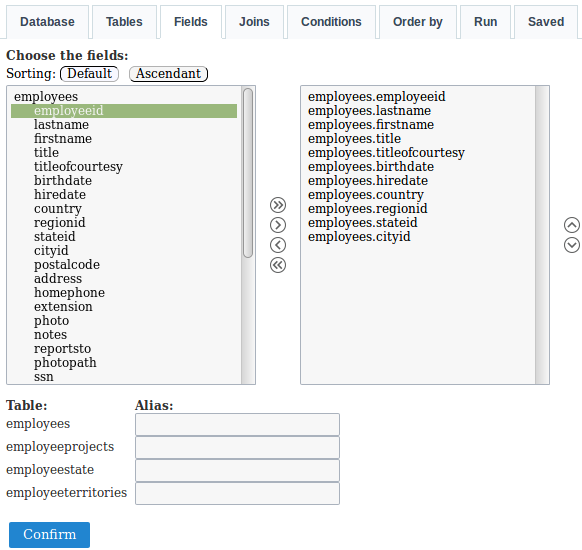 Select the desired tables to create the query. You can select various tables, although they need to have a relationship between them. 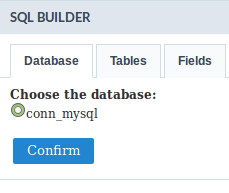 It is possible to create an alias for the selected tables, this option can be found below the field list were also all the selected tables will be listed. 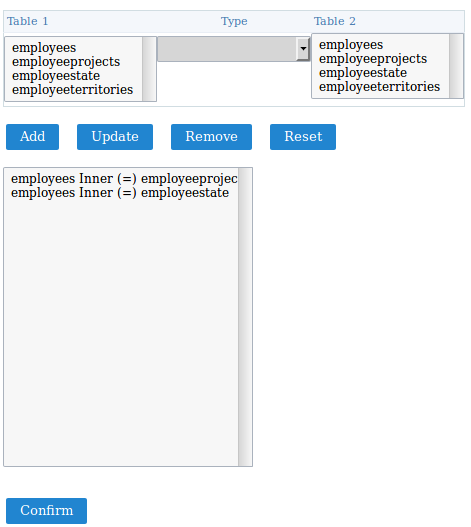 Defining the fields, it is necessary to configure the join. 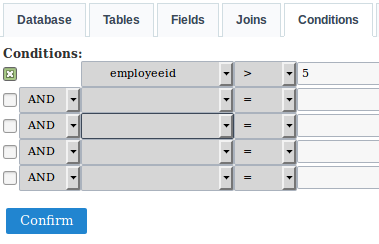 To do that, you need to select the tables that have a relationship, next you will select the type of join that will be used in the field Type then click on Add. 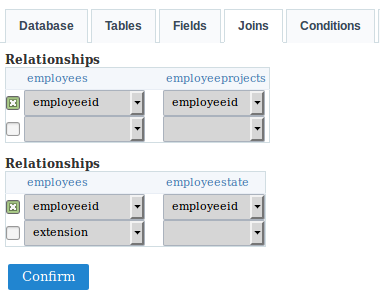 After clicking on add, click on Confirm, so that you can inform the fields that do the relationship between the tables. Defining the fields, you will be redirected to the run tab. 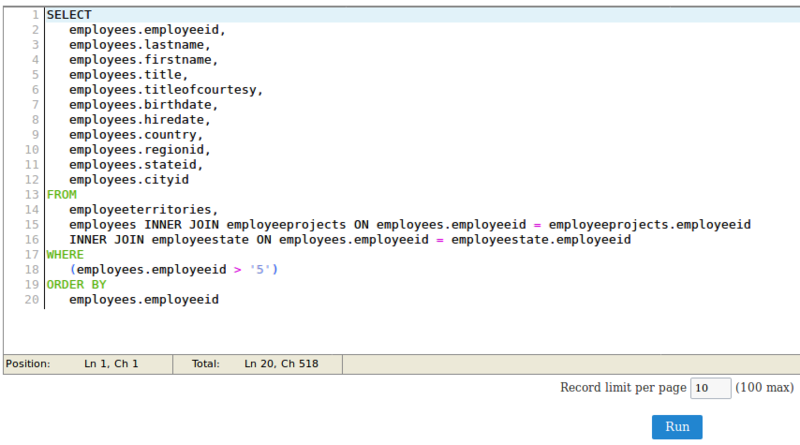 You can add the “WHERE” clauses where the query was created. Define the sorting of the query result display. This is where you can run the SQL commands. The result of the query configuration wizard will be displayed on this tab. You can run DML (Data Manipulation Language) commands here and also DDL (Definition Data Language) commands. You can define a total of records per page. To save the created commands, just inform the name of the query and click on the save button. The commands that are already, will be listed.